13 Insane Penguins and Squirrels: Olivia's afghan. I'm not too sure if I have shared this before but, these are a bunch of flower parts four Olivia's afghan. I let her plan with them and it was a blast to watch her. Before she would pick them up and move them around a little bit. Now she squeals, tosses and puts them into things. She has grown so fast. She even is walking a lot! 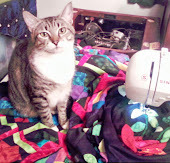 Well now to go and work on my sewing room. The Bionic Man can wait for later. What a cutie! 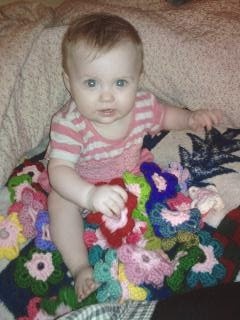 Love those little flowers for her afghan.